Four corporate attorneys based in Washington D.C filed suit against Baltimore County on Dec. 30 on behalf of three of its inhabitants over alleged mistreatment of animals at the county’s shelter in Baldwin. Each of the plaintiffs had adopted an animal from that facility, which either died or had to be euthanized shortly thereafter. 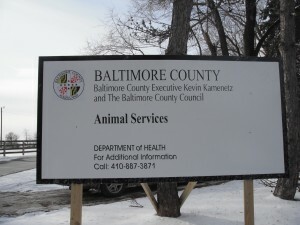 The complaint, which names County Executive Kevin Kamenetz as a defendant, alleges that BCAS denied animals: adequate food, clean water, basic veterinary care, proper exercise, and a clean living environment. It also suggested that shelter personnel did not make sufficient attempts to contact the owners of animals who accidently wound up in BCAS custody-and at times euthanized animals without justification. Kevin B. Collins of Covington & Burling LLP-who is representing three clients on a pro-bono basis-along with several of his colleagues-was more direct. “A number of witnesses have come forward to describe legal violations occurring at the County’s shelter; the plaintiffs are seeking only to compel the shelter to follow the law,” Collins said. Jody Kesner of Pikesville reaffirmed this commitment. “Through this lawsuit, I am hoping to achieve important changes at the shelter such as more adoptions and less euthanizations,” Kesner said. 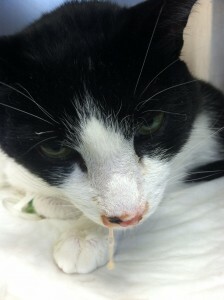 Kesner’s heartbreaking experience began after becoming acquainted with Myles- a black and white cat, which previously belonged to her friend and had arrived at the shelter in apparently perfect health. Three days later she arrived at the shelter to find Myles extremely ill and allegedly neglected. Kesner adopted him and spent the next two weeks taking Myles to veterinarians-who unsuccessfully attempted to nurse the animal back to health-before she was left with no other choice than to euthanize Myles. Jody Rosoff of Essex had a similar experience when she adopted Spirit-a stray dog-who unlike Myles-entered the shelter in dire straits-but also left in even worse condition. “She walked into the shelter and never walked again,” Rosoff said. Spirit had spent several days at BCAS where she had become too weak to walk after allegedly being denied medical care. Moreover, a veterinarian Rosoff had brought to the facility who offered to examine the dog for free was not permitted to examine Spirit, and Rosoff was told she could not take the dog home for another three days. Baltimore County Animal Shelter is being sued on charges of animal abuse. By the time Spirit was released into Rosoff’s care, she was unable to walk on her own and shelter staff had to carry the animal to her new owner’s car. Despite consistent medical treatment, Spirit would share the same fate as Myles after less than two months. Anne George of Timonium adopted a dog from BCAS named Sylvie. Sylvie allegedly suffered from kidney disease while living at the shelter and is believed to have been denied adequate veterinary care. Shortly after the adoption-Sylvie was diagnosed with kidney failure-by a veterinarian who in turn recommended that she be euthanized. Anne, understandably heartbroken and disappointed, agreed. The tragedies surrounding the untimely deaths of these three animals-and the personal anguish endured by their owners-comes amidst plans by county officials to build a new and improved facility-scheduled to open in August. In the meantime, council members are considering legislation that would establish a commission to provide advice in lieu of preventing further alleged transgressions at BCAS. BCAS staff declined requests for an interview. I adopted a dog recently from the shelter above, she was scheduled to be terminated on 12/22 and with help I got her adopted into my home to stop the process. They had problems adopting her out as she was supposed to have a bad knee (quite expensive to fix), swollen lymph nodes and a neurological condition due to an episode of passing out she had exhibited while walking. Except for a Snap test (for the lymph nodes) no other testing was done, she was put on fluids and diagnosed incorrectly. The antibiotics given were short term and not enough to help her swollen glads or infection. She does not have a bad knee, the “neurological’ episode was from walking the dog and having no control, (she pulls and they use choker collars) due to her swollen lymph nodes she lost air and fell to one side until the collar was released. They were unable to spay the dog due to her glands but aside from that she was emaciated and frail, now she is healthy and happy. Charges could be filed for so many! To mention two in particular, the cat with the broken jaw and the other cat that had a collar embedded that had to wait days to see a vet. The vet was only available for a few hours, a couple days per week at the beginning of 2014. Definitely noticeable, cruel and neglectful!